I recently received a request on MySpace from a “Mytwilightpilot,” which sparked my interest since it’s a name I hadn’t thought of for a while now. I was cycling through the iPod yesterday and came across their EP and gave it a long overdue spin. I just checked out the MySpace page — it’s basically a tribute to the band that contains the band’s brief history along with a couple of live tracks and two songs from their 555 EP, which was released on NYC’s Feel Records in 2003. 555 contains some excellent songs, but unfortunately the band dissolved shortly after its release due to “varying personal and psychological hardships” and “numerous internal differences.” Roughly translated: problems with drugs and money. The MySpace page also indicates “While some have since moved on to other musical outfits, others have abandoned the scene and their instruments entirely.” That’s sad. 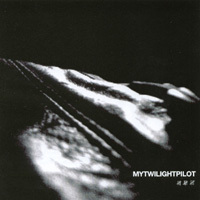 If you haven’t ever heard Mytwilightpilot’s 555, it reminds me a bit of mid-period Radiohead but is darker, dronier, and spacier. I highly suggest spending the $8 at CDBaby for their EP. At the very least, you can stream clips of the tracks and judge for yourself. I was introduced to one of the band members at an Earlimart show a couple of years ago, and we talked about how he was still writing songs — however, I have no clue what music, if any, has come out of any of the band members since MTP. Feel free to email me or make a post below. I am curious about their new music — seems a real waste of talent. Give 555 a listen and you’ll understand what I mean. Major is now playing bass for the Kimonos with his wife Gina. Jimmie plays (played) drums with the briefly formed Leia Sara, which included members of Sail on Silvergirl and Of Normandy. Matt Loftin now live in Japan teaching English to the locals. I played with Jimmie in Leia Sari. I don’t know what happened to him or the bass player from Of Normandy. They both kinda disappeared and the band dissolved. I started a band called Sea Surrounds Me shortly thereafter, but that ended in the summer of 2008. I haven’t lived in Houston since then. That’s all I got. Sorry for the late response (7 yrs lol). I saw MTP live once at Mary Jane’s. I bet the venue is something totally different now. Great show!.